Ever since I saw Kate from Centsational Girl's DIY tufted headboard I had been wanting to try it. She has beautiful style and always great tutorials. 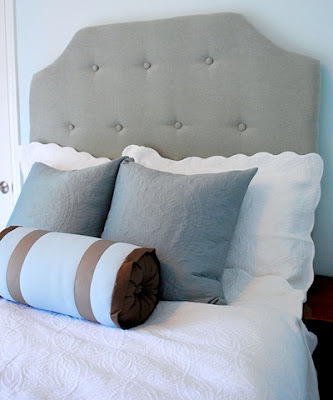 Here is her tufted headboard that inspired me! After following her tutorial that you can see here, this is what I came up with! Tomorrow I will show you the king size tufted headboard I finished for a client! Trish, your headboard is fabulous!!! Aren't those buttons a pain? Sheesh! But so worth it! Gorgeous result girl! What fun following your blog! The headboard is beautiful. I also love the bedspread. Is that your creation also or did you find it ready made? It would look great in my master bedroom.